If you also came to our events this summer and didn’t get asked to fill in our feedback forms or meant to reply to our email and didn’t, please consider adding your comments below. Street theatricals, performers, plants, birds, bees and giraffes brightened the Flyover at the bank holiday. Fool size Theatre, Gobbledegook, VIP Puppets and Bread and Butter Theatre turned the Churchill Way Flyover into a carnival of colour, light and family fun in the latest Flyover Takeover of the summer. It was a day for the whole family to enjoy. The Flock from Fool Size Theatre is an unusual tribe of birdlike bikers. A raucous street circus, who ruffle their feathers and flaunt their leathers. Gobbledegook Theatre brought The Grass Ladies, three delightful ladies called Mo, Daisy and Lawn-a, clad in gorgeous dresses made from artificial turf inviting families to take part in some lovely private garden parties, complete with acappella singing and mini-concerts. A concrete flyover might not seem like the place to see lifesize giraffes, but that’s what VIP Puppets brought to the Takeover. Family favourites, Liverpool’s specialist puppet theatre company brought their giraffe family to walkabout and roam the Flyover. To continue the theme of nature and nurture, Farm Urban ran a Build Your Own Aquaponics System Workshop suitable for families or individuals – The Farm Urban team introduced people to the wonders of Aquaponics; a food production system which combines aquaculture (growing fish) and hydroponics (growing plants without soil) to produce fish and vegetables in a fantastically efficient and sustainable way. from midday we turned the carriageway into our temporary urban park and filled it with dancers, food, bicycle smoothie machines and much more! Exploring love, freedom, blood, sweat and rainstorms: Frantic is an explosive acrobatic exploration of our relentless devotion to busyness, the reality of a running mind and one man’s thirst for escape. Frantic features spectacular acrobatics and dance-theatre, choreographed around a wheel, with a hidden water system for a joyous finale danced in pouring rain. We also had a wonderful mix of dance class meets flash mob meets performance by MoveMe which got all our audience involved! Using a storytelling method to take the audience on a journey through an irresistible pop track, professional dancers taught people of all ages and abilities a contemporary dance choreography in just 40 minutes. We had 3 FREE community workshops for you to choose from and once the learning was over the Flyover was a space of shared fun and movement. Strictly Cycling workshops were run in Everton Park and audiences had the chance to take part or watch the awesome Bicycle Ballet company’s exhilarating dance performance on bikes, exploring the joyful highs and gritty lows of cycling. Their choreography fused dance and physical theatre with visual spectacle, comedy and striking soundtracks. Epic Awards is an annual initiative run by Voluntary Arts The awards champion creative cultural participation and shine a spotlight on excellence and achievement in the voluntary arts sector. “Many congratulations to Friends of the Flyover for winning the Epic Award 2015. They can, and should, be very proud indeed for what they have achieved in such a short amount of time. Flyover Fest is a fantastic example of local people working together creatively and with innovation to transform their community through the power of arts and culture. I have seen this happen with other projects in all parts of the country, and it is inspiring to see the effect that taking part in creative cultural activity can have on the lives of people, and the strength and identity of their community. http://friendsoftheflyover.org.uk/wp-content/uploads/2015/05/blog-epic-awards.jpg 300 950 churchill http://friendsoftheflyover.org.uk/wp-content/uploads/2013/04/friends-logo.png churchill2015-05-26 15:00:512016-07-20 16:16:32We are EPIC! WINNER – eccentric idea of the year! We are OVERJOYED to have been thought worthy of being nominated in the Sense of Place Liverpool Awards………. Friends of the Flyover, Monkey Map, Post Code Honey, Liverpool Giants (plus memories of the Liverpool spider). Explaining that I mean ‘eccentric’ as a good thing. An idea so good that you look at it and think ‘Where did that one come from?’ – we set about discussing which of these add the most to Liverpool. Sarah’s ‘Monkey Map’ website, her mission to log every monkey puzzle tree on Earth from her Liverpool base, was as ever fascinating to all and rightly recognised as an ongoing mission of breathtaking eccentricity. But no more about Liverpool than it’s about everywhere else where the trees grow. So awarding this one to the Friends of the Flyover for the richness their idea will add to Liverpool life was an easy decision for us all. One of the very best days of the year was the day the flyovers were closed to traffic and we all tried the idea out by going for a play around on the skyroads. It’ll cost less to make this idea a reality than it would to knock the things down. So let’s get on with doing it so before long the flyovers are competing for Place of the Year at future Liverpool Awards. http://friendsoftheflyover.org.uk/wp-content/uploads/2015/05/fav2.jpg 581 1200 churchill http://friendsoftheflyover.org.uk/wp-content/uploads/2013/04/friends-logo.png churchill2014-12-02 22:00:462016-07-20 16:37:21WINNER - eccentric idea of the year! 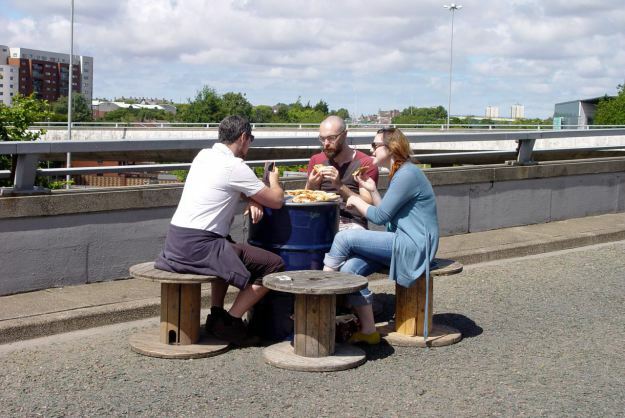 The Flyover is one of Elaine’s examples of citizen-led use of space and our Flyover Fest and our plans for our Promo Phase are firmly on the agenda of ODPM and this fabulous project which will be rolled out in the new year! http://friendsoftheflyover.org.uk/wp-content/uploads/2014/11/northern-futures-info-graphic1.jpg 440 880 churchill http://friendsoftheflyover.org.uk/wp-content/uploads/2013/04/friends-logo.png churchill2014-11-27 17:59:562016-07-20 16:37:27Firmly on the agenda!